The standard BMW wheel locks are not particularly secure as there are a limited number of combinations. 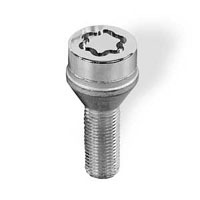 The best alterative are the McGard bolts shown below. These can be obtained from many places. The correct type for original E36 alloys is 27179 contrary to what it may say in places like Halfords.